This is an easy and tasty way to showcase fresh spinach, and it’s also a sneaky way to get kids to eat it. 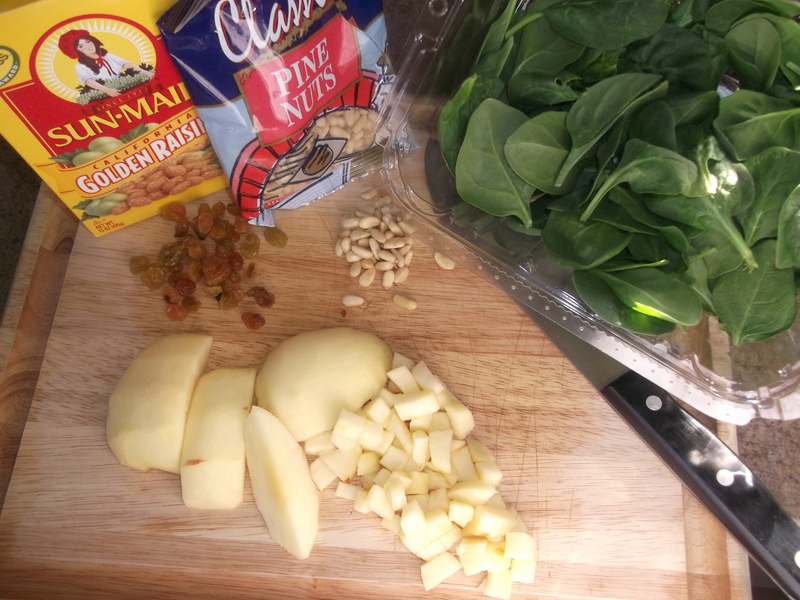 Mixed with apples and raisins, it’s a delicious side dish that will trick kids (or other non-spinach lovers) into eating it, and it’s packed with healthy goodness and flavor. It’s another recipe I love from one of my favorite chefs, José Andres. I first tried — and fell in love with — this dish at one of his signature tapas restaurants, Jaleo, in Washington, D.C.
Heat the olive oil in a large pan over a medium-high flame. When the oil is very hot, add the apple cubes and cook until they are lightly browned, about 2-4 minutes. 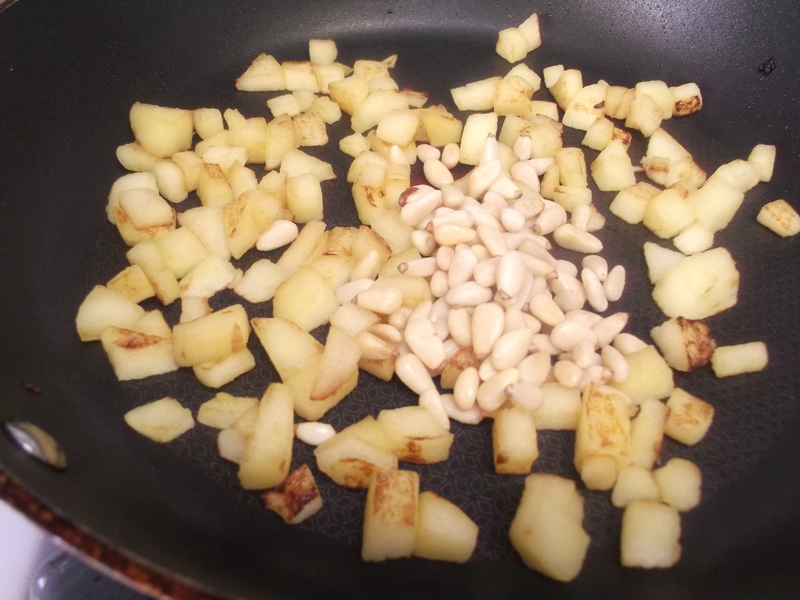 Add the pine nuts and cook until they are lightly browned, about 20-30 seconds. 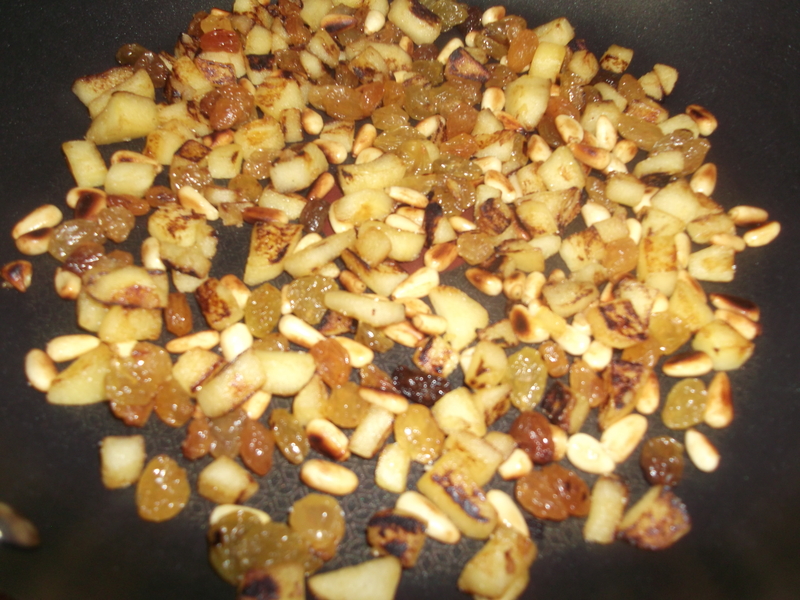 Watch pan carefully as the pine nuts can burn quite easily! Constantly stir the nuts to avoid burning. Add the raisins and the salt and stir together. 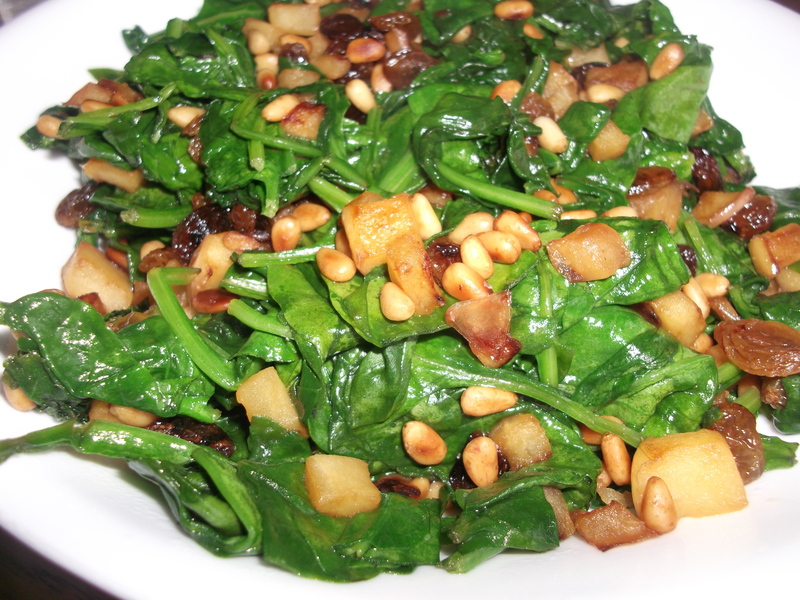 Add the spinach and sauté very quickly until it just starts to wilt, only about 20-30 seconds more. 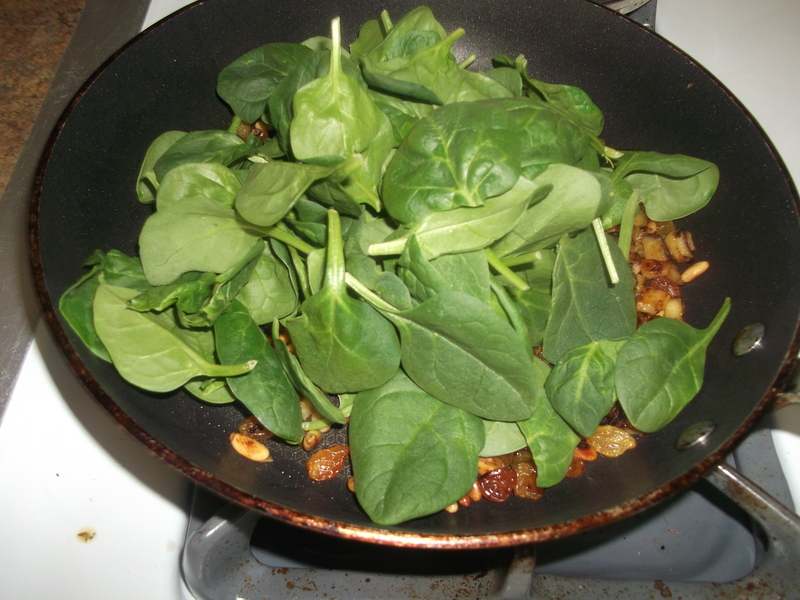 Remove the pan from the heat, and the spinach will continue to wilt off the heat. Add salt to taste, and serve immediately. This recipe cooks up quickly, so be sure to have everything ready to go when you begin. Don’t worry too much about exact measurements – just think of this as a starting point. You can use either regular dark raisins or the golden ones, as I did here. It will taste just as good either way. I just like the golden color better. Heat the olive oil, and once it is very hot, add the apple cubes and cook until they are lightly browned, about 2-4 minutes. It might take longer if you have a wetter apple. Don’t worry too much about browning every side of the cube. Once most of the cubes are starting to brown, add the pine nuts. Cook, constantly stirring, until the nuts are lightly browned, about 20-30 seconds. Watch them carefully as they can and will burn very quickly. When they are just browned, add the raisins and the salt. Stir it all together to mix it well. 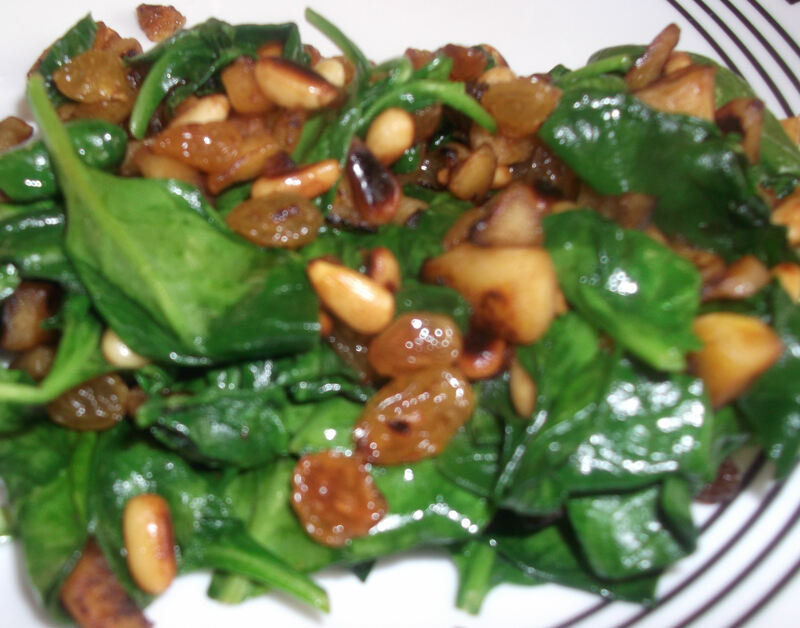 Sauté the spinach very quickly until it just starts to wilt, only about 20-30 seconds longer. Really. That’s all. 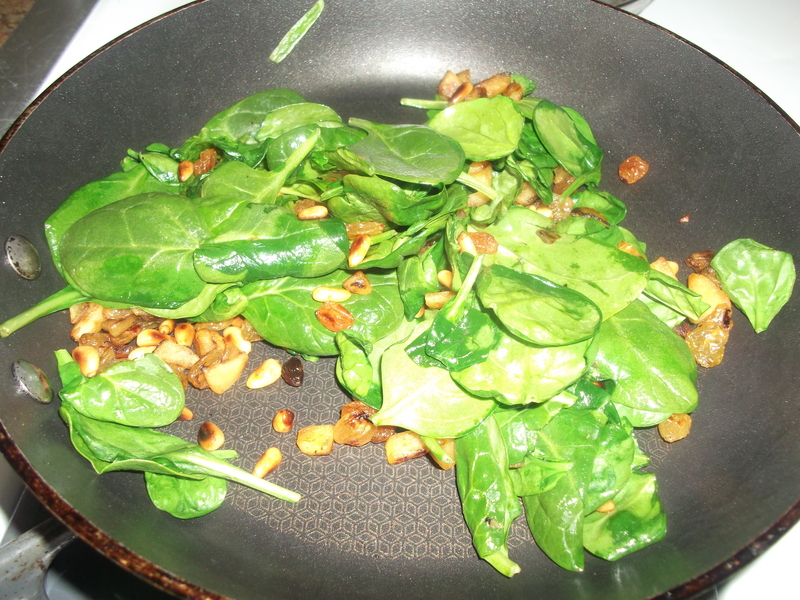 Remove the pan from the heat, and the spinach will continue to wilt off the heat. Trust me: it really will continue cooking. The first few times I made this I wanted to make sure it all wilted, and I left it on the heat so long it nearly disintegrated. Not a nice texture. Trust the process. Add salt to taste, and serve immediately. This pairs wonderfully with wine: either a red Spanish Tempranillo or a crisp white Spanish Albariño. Enjoy! Just happen on this page. Looks very delicious. I will definitely try this recipe. Thanks.